Edward Doddridge, a postdoc in the Department of Earth, Atmospheric and Planetary Sciences at MIT, co-developed a model to investigate the mechanism behind phytoplankton growth within subtropical gyres. With nutrients in short supply, phytoplankton, the microscopic plants that form the basis of the marine food chain, struggle to thrive. However, some phytoplankton do live within the hostile environment of these gyres, and exactly how they obtain their nutrients has long been a mystery. Now research by Edward Doddridge, a postdoc in the Department of Earth, Atmospheric and Planetary Sciences at MIT, has found that phytoplankton growth in subtropical gyres is affected by a layer of water well below the ocean surface, which allows nutrients to be recycled back to the surface. Working with David Marshall at Oxford University, Doddridge has developed a model to investigate the mechanism behind phytoplankton growth within the gyres, which appears in the Journal of Geophysical Research: Oceans. According to the textbooks, winds push surface waters into the center of the gyres and then downward, taking nutrients away from the sunlit zone and therefore preventing phytoplankton from thriving. But previous research by Doddridge has suggested that this view is too simplistic, and that the motion of eddies — the ocean equivalent of weather systems — within the gyres acts against this movement, preventing the water from being pushed far downward. To investigate this further, the researchers developed a simple computer model, in which they split the ocean into two layers: the sunlit layer and a layer of homogenous water below it, called mode water. Beneath this layer of mode water is the abyss, which was not included in the model. Within the model, the researchers included both the wind-led process of water convergence from the sides of the gyre and then downward, and the way that eddies should act against this movement. When they ran the model, its results broadly mirrored observations of the gyres themselves, with higher nutrient concentration and phytoplankton productivity at the edges of the gyres, and lower productivity in the center. They then began varying the different parameters of the model, to investigate what effect this would have on nutrient levels and phytoplankton productivity. They first varied a mechanism proposed previously by researchers and known as eddy pumping, in which the swirling motion of circular currents draws colder, nutrient-rich water up from below. “We changed how much fluid this mechanism could swap between the sunlit layer and the homogenous layer below, and we found that as we increased the eddy pumping, the nutrient concentration went up, as suggested by previous research,” says Doddridge. However, the effect of this eddy pumping began to plateau at higher levels. The more the researchers increased the eddy pumping mechanism, the smaller the increase in nutrient concentration became. They then varied the process of horizontal water convergence and downward pumping within the gyres, known as residual Ekman transport. They found this process had a considerable impact on nutrient concentration. Finally, the researchers varied the thickness of the layer of homogenous water below the sunlit layer, which they also found to have a significant impact on nutrient concentration. Previous research had suggested that as this layer of mode water gets thicker, it blocks nutrients coming up from below, resulting in lower productivity levels in the sunlit zone. However, the results of the model suggest the opposite is the case, with a thicker mode layer leading to greater nutrient concentration. This was particularly the case when the level of Ekman transport was low, Doddridge says. 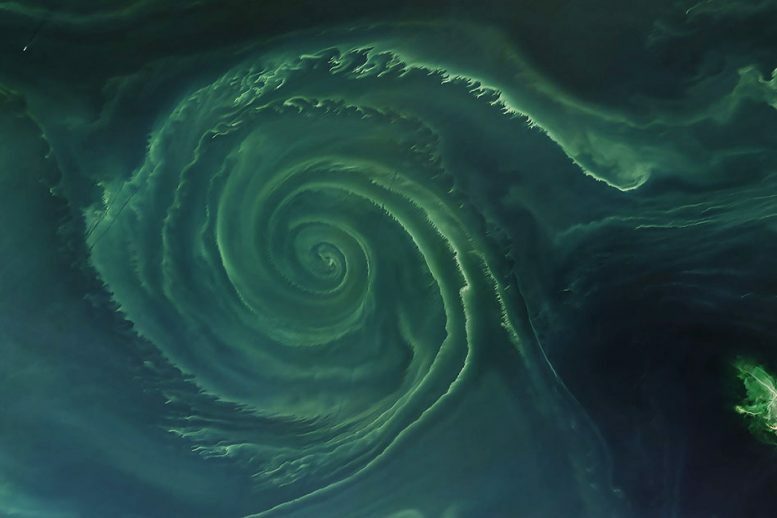 “When phytoplankton and other things living in the sunlit layer die, or get eaten and excreted, they start falling down through the ocean, and their nutrients are absorbed back into the water,” Doddridge says. While the nutrients remain in the homogenous layer, it does not take much energy for them to be mixed back up to the surface, Doddridge says. But if they quickly drop below it into the abyss — because the homogenous layer is thin, for example — the nutrients are essentially cut off from the surface water above, he says. When the researchers tested the results of the model using data from satellites, autonomous robots, and ships, they found that it supported their findings, suggesting that thicker mode water does indeed enhance phytoplankton growth within subtropical gyres. In the future, Doddridge would like to carry out further experiments using more complex models, to gain further insights into the way in which nutrients are fed into and recycled within subtropical gyres. The nutrient-poor upper ocean waters of the subtropical gyre play globally important roles in ocean carbon uptake, with biological processes mediating a large fraction of this carbon uptake, but the processes supplying nutrients required to support net biological production in these ecosystems remains unclear, according to Matthew Church at the University of Montana, who was not involved in the research. Be the first to comment on "Scientists Reveal How Phytoplankton Survive in Nutrient Deficient Ocean Gyres"